Vanderbilt Heart and Vascular Institute now offers patients with atrial fibrillation (AF) an alternative treatment to reduce their risk of stroke, potentially avoiding the long-term use of blood thinners such as warfarin. Vanderbilt physicians utilized a trans femoral approach to implant the WATCHMAN LAAC device in two patients on June 16. Both patients have non-valvular AF, a heart condition where the upper chambers of the heart beat too fast and with irregular rhythm. The condition puts patients at higher risk for blood clots that cause strokes. AF, the most common cardiac arrhythmia, affects more than 5 million Americans. The patients, ages 71 and 74, were on blood thinners to prevent clots, but staying on these drugs long-term poses its own risk, said Christopher Ellis, M.D., assistant professor of Medicine. Despite its proven efficacy, long-term warfarin is not well-tolerated by some patients and carries a significant risk for bleeding complications. Nearly half of AF patients eligible for blood thinners are currently untreated due to tolerance and adherence issues. People with AF have an increased risk of stroke because it can cause blood to pool and form clots in an area of the heart called the left atrial appendage (LAA). For patients with non-valvular AF, the LAA is believed to be the source of blood clots. If a clot forms there, it can break loose and travel in the bloodstream to the brain, lungs and other parts of the body, causing a stroke. 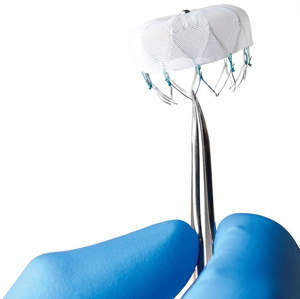 The WATCHMAN device resembles a small, mesh cap that is sent up to the heart via a sheath inserted in the femoral vein. When the sheath reaches the LAA, the cap is deployed, and it closes off the appendage, blocking potential blood clots from entering the bloodstream. With the device securely in place, the risk of stroke may be reduced and, over time, patients may be able to stop taking warfarin, according to Ellis, who along with Rob Piana, M.D., professor of Medicine, performed the first two implants at Vanderbilt. “Eventually our program is going to be huge here. Given the elegance of it, how simple it is, it’s hard to argue that it shouldn’t be considered an option for any patient with non-valvular atrial fibrillation who takes a blood thinner,” Ellis said. The WATCHMAN Implant from Boston Scientific has been approved in Europe since 2005 and is FDA-approved in the United States. It has been implanted in more than 10,000 patients and is approved in more than 70 countries around the world.